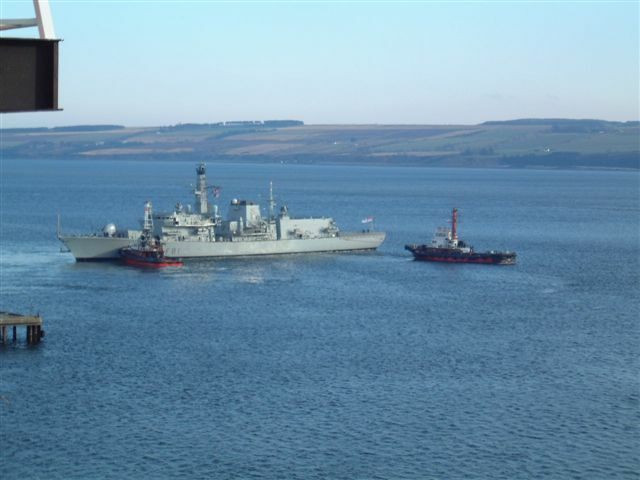 HMS Sutherland being assisted by J. P. Knight's tugs at the Supply Base. Kincraig is pushing and the Kinross is pulling. Changed days for the Royal Navy - I have seen Cruisers turn at the Admiralty Pier with no assistance in years gone by ...no tugs then. The picture was taken in February 2003 from a rig in the wet dock at the time. Hello Duncan, I remember all the ships coming alongside without any help, only the harbour launch to take the ropes. I don't remember the pilot ever taking in or undocking a Royal Navy ship.